Giving a gift that you make typically means more to the person receiving it than if you were to just give something that you purchased. So in this video I’m making a few gift boxes to give for Christmas. I’m using curly maple and what I think is spalted soft maple. These are boards I purchased from Bob Kloes in a recent trip to Wisconsin. If you’re interested in some really figured wood then stop by his website. He only stocks figured stuff, has great prices, and ships. I spent a few hours in his shop with a couple of friends of mine and Bob is such a really genuine guy. So if you’re interested, be sure to check out his website. Something I picked up from Bob was that the most figure will be on the bark side of the wood. The curly maple board that I used had some defects that prevented it from being used at its full width so I chose the side that had the most figure and used the jigsaw and bandsaw to cutout what I needed. Next up is the jointer and planer to get the boards flat and parallel. 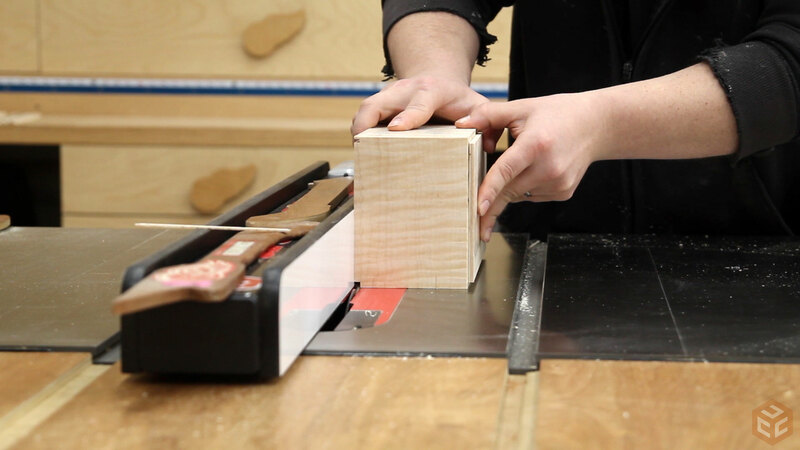 This was my first experience using really figured wood on a jointer and planer and the helical head on my jointer left a flawless surface with no tearout where as the straight knife cutter head of my planer really didn’t do a good job. I had to take extremely shallow cuts on the slow speed to prevent tearout. 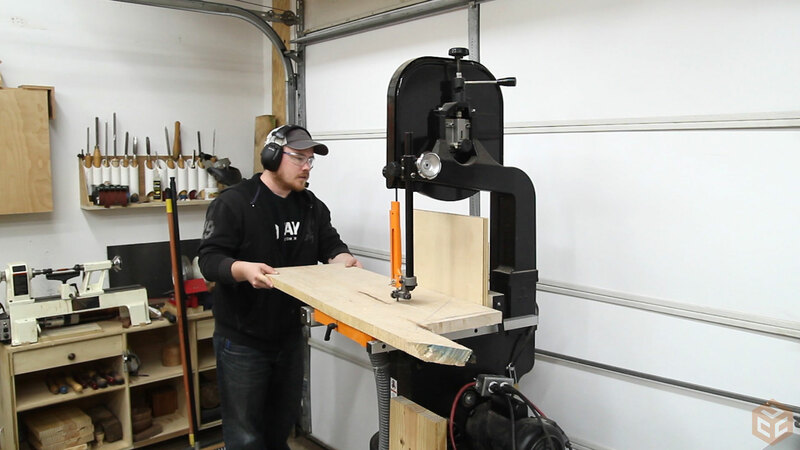 The stock I started with was a heavy 4/4 so I resawed everything down the middle and then planed to 3/8” thick. From there I used a couple spacer blocks at my miter saw to cut the four box sides. I cut these so that there will be one back corner where the grain starts and stops because that’s the only way I’ve ever done this. However, quite a few people on instagram told me that there is a way to do a 4 corner continuous grain with no start and stop points. At this point the sides looked a little tall so I trimmed them down at the table saw. I don’t recall what the dimension was as I wasn’t going for a certain number. Just whatever looked appropriate. Then I tilted the blade to 45 degrees and cut a test joint to make sure everything would line up. I set a stop block on my miter gauge so that I wasn’t removing length, just beveling the edges. It worked out really well. I wanted the top and bottom to be the same material and glued in a rabbet but in order for this to work I need to make veneer and glue it on plywood. That way the panel is dimensionally stable and I shouldn’t have to worry about expansion and contraction. The plywood that I’m using is sold locally as 5mm hardwood plywood underlayment. I also made sure that the plywood was cut with the top and bottom layers perpendicular to the wood I’m gluing on. After those panels dried I used one to set the height of my table saw blade and cut a rabbet the same depth as those panels on the top and bottom of all of my box pieces. The rabbet width was sized so that there was only about 1/16” of material left to the thickness of the box sides. 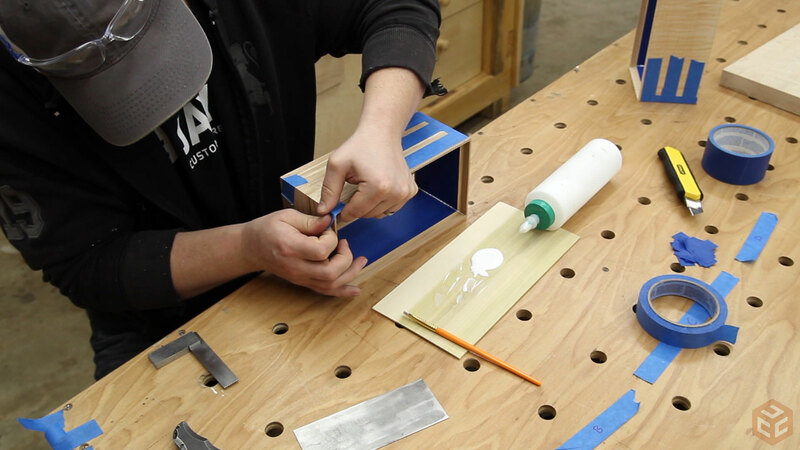 As the old saying goes, “an ounce of prevention is worth a pound of cure.” To prevent any glue squeeze out from staining the interior of the box I taped off the inside faces. Then tape can be used as a clamp to roll up the boxes with glue in the joint. I find a cheap paint brush to be perfect for applying glue in these situations. 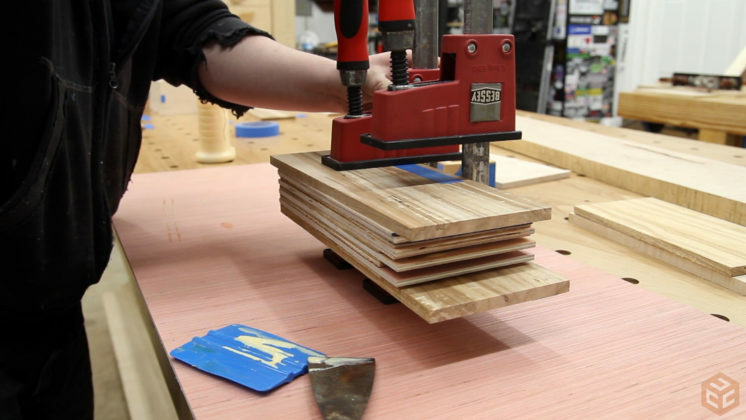 Next up the plywood panels can be sized to fit into the top and bottom rabbets. Because of the way I will inlay some walnut on the top and bottom perimeter absolute precision isn’t necessary when sizing the top and bottom panels. I’d actually prefer it to be a little bit of a loose fit as the glue will hold everything in place and it reduces the risk of me breaking the sides as I glue them in place. Once the glue dried on those I set the table saw blade so that it was 3/16” high and the outside face was 3/16” away from the fence. This allows me to take two passes to create a symmetrical rabbet on the entire top and bottom perimeter. regardless of how precise the top and bottom panel were sized in the previous step this cuts beyond the perimeter of those panels and into the area which creates a precise line where the panel ends. I wanted a high contrasting wood to inlay in the rabbets so I chose walnut. I had to go through the milling process first and then I cut a few strips that were exactly 1/4” x 1/4” square. Any time you are making specific size inlay material for a project it’s a good idea to cut a few extra pieces so you can keep working in the event that you accidentally make a wrong cut during installation. 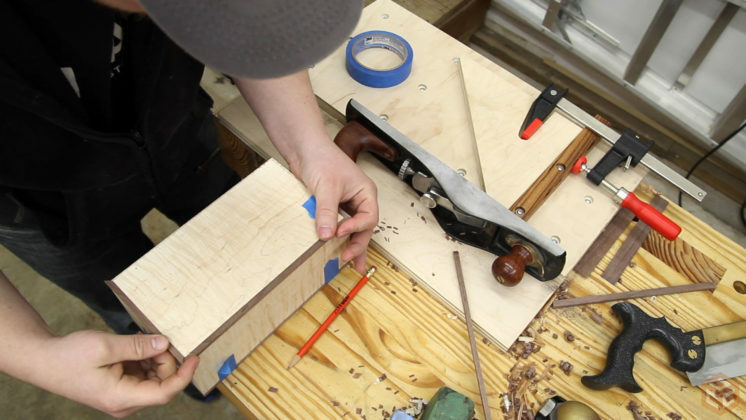 Because my shooting board is set up for right-handed use I worked clockwise around the box when fitting the walnut. First cut a rough 45 degree angle with a saw, make it an accurate 45 degrees with the shooting board, put it in place and use a scrap piece with an accurate 45 degree angle to see if the piece is the appropriate length, and then trim down as needed until that piece has perfect miters on both ends. Once a piece is fitted use a couple of pieces of blue tape to hold it in place while you work on the next piece. Then use the tape to lift the piece out of the rabbet, insert glue, and then tape it back down. 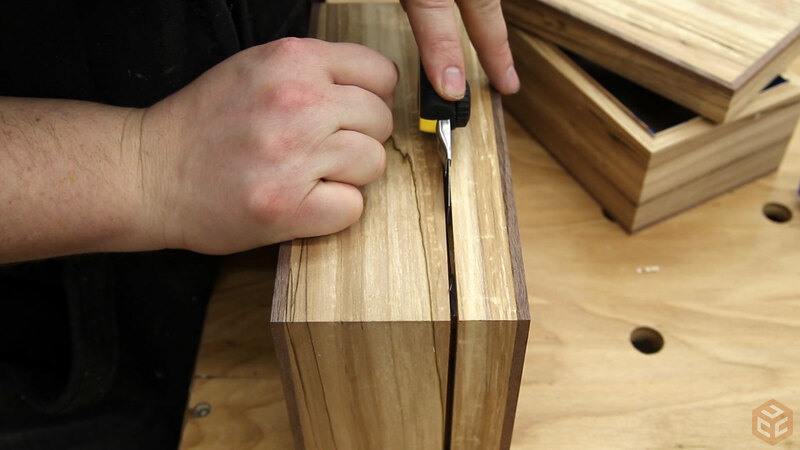 With the walnut glued in place I alternated between a couple of hand planes to trim it flush with the box. To prevent tearout I planed into the corners in a couple of situations and when I was getting down to the last little bit I used my block plane in such a way that at the end of the cut I skewed the plane similarly to a paring cut with a chisel to slice away the last corner and reduce the chance of tearout. I used the table saw to separate the lid which is always a little nerve-racking. I read somewhere that it’s a good idea to set the blade so that it doesn’t cut all the way through the wall thickness which will eliminate the possibility of damage as the second piece might accidentally contact the blade as it is removed. Then you can break the pieces apart with a sharp utility knife. This worked really well. A little bit of sanding to remove the saw marks and then the hinges can be installed. To layout the hinges I first marked the same distance in from each side with a marking knife. Then the hinge itself can be traced with a marking knife and a wide chisel can be used to make the knife lines a little bit more pronounced. 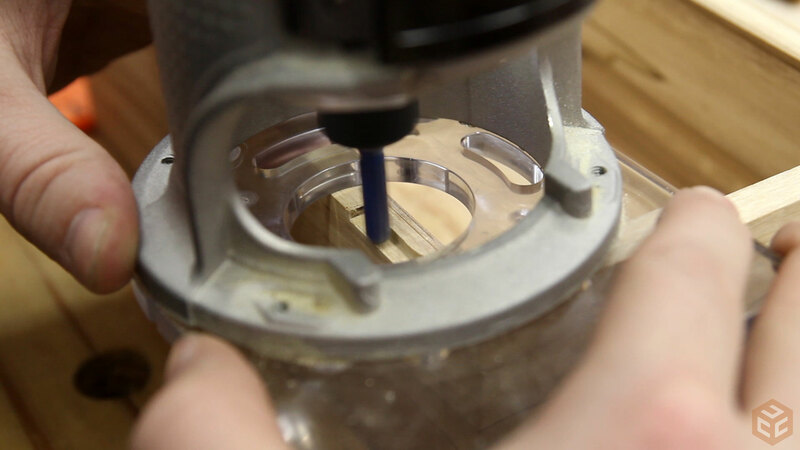 With the geometry established I set a router to a depth of half of the closed hinge and carefully removed all of the interior material making sure to not touch the layout lines and not rock the router any. Then a sharp chisel can clean up the mortise quite easily. 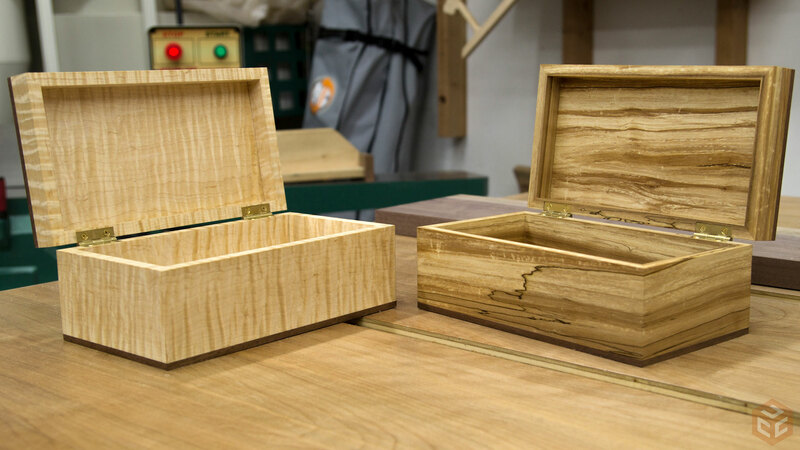 I used an awl to mark the screw holes slightly offset to the inside of the box. That way when the screws are driven down the head of the screw will force the hinge to seat tightly into the inside face of the mortise. When using screws this small in hardwoods it’s also a good idea to add a tiny bit of wax to the threads. After a little bit of sanding I applied a couple of coats of shellac. I’m not entirely done with this project at this point but as it sits the boxes themselves are done. I only added hinges to two of the four because I want to do something different with the other two and I didn’t add anything to the insides just yet. I’ll cover all of that in the next video. Until then, have a good one, and I’ll talk to you later. As always perfect and very capricious !!!!!!! Fantastic gifts Jay. I’m sure they’ll be appreciated. 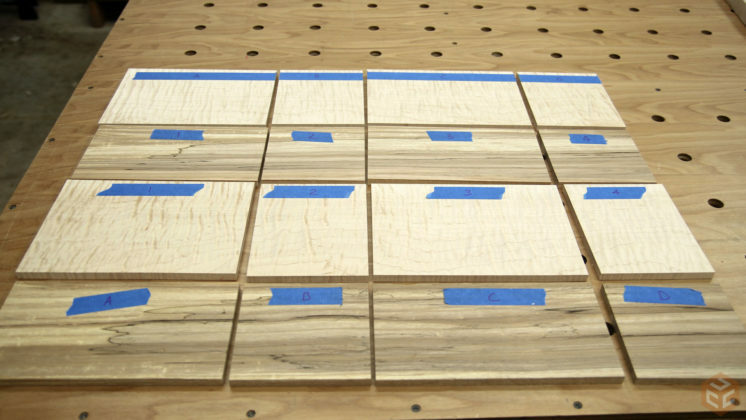 I have planed a lot of highly figure curly maple and birds eye and there is a trick to doing it successful . You will need a cotton rag and a bowl of water Every time you make a pass throw the planet the entire surface needs to be damp.you need to do this for every pass. Don’t asume you can make it damp and get two pass throw the planer it does not work. This merged also works on the edge for jointing. Good tip, Larry. I’ve never heard that. Thanks Larry! 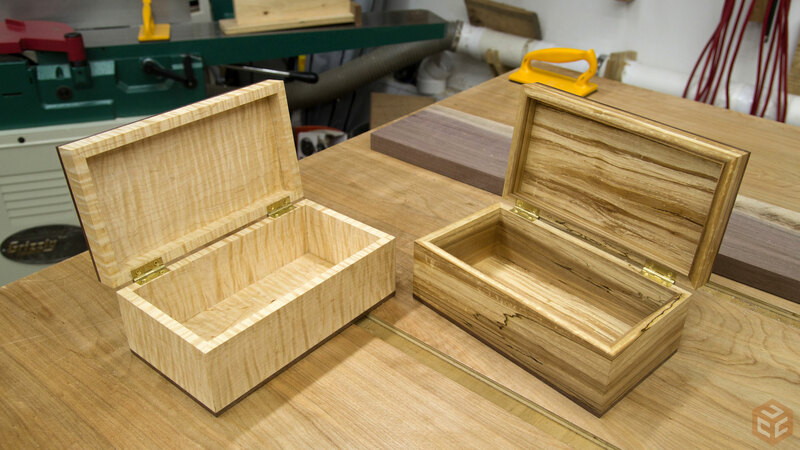 I will be trying that out as I am making a music box out of curly maple and this is my first time working with it. where do you buy the misic box mechanisms? You can find cheap ones for around $13 on Amazon or Rockler. But if you want a good selection of songs, I found Music Box Attic in my searches. The mechanism will be around $30 for an 18-note mechanism. As jewelry/keepsake box making is what I really enjoy most in my woodworking this video was especially rewarding to watch for me. 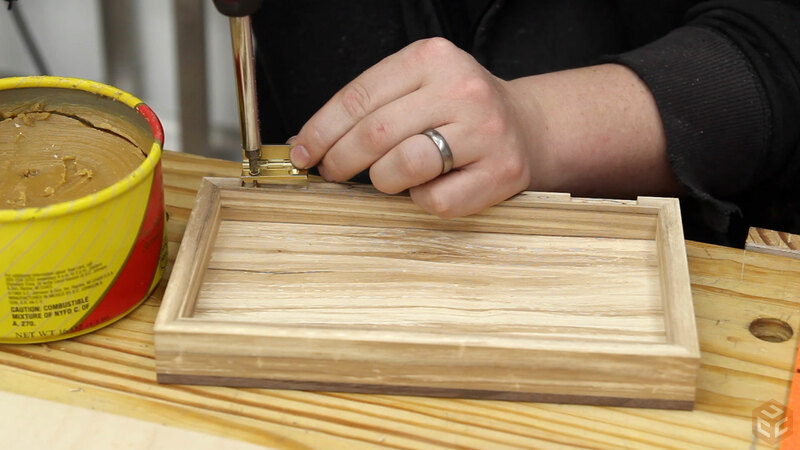 You really gave me reason to make a shooting board set up, cutting miters and getting them right is always a challenge and your method appears to simplify this and can be meditative as well. Your hand plane technique is something I will probably adopt too. From a safety standpoint, the gap behind the table saw blade combined with the short, thin work pieces made the hair on the back of my neck stand up. please consider a zero clearance insert on your saw if one can be made to fit. You most certainly want to end the day with the same number of fingers that it was started with. Seasons greetings to you and yours. Hey Jay, beautiful work as always! I’m just wondering if your going to have plans for these boxes? That is some beautiful work Jay. Before I read the article I thought a box, how hard could it be to make a box? Your attention to detail is inspiring. Thanks for the lesson. Love the video, and the technique. But most of all, I love the pace of your videos! They are very soothing on the nerves! It is almost like you do things in a meditative state! Appreciate the knowledge! 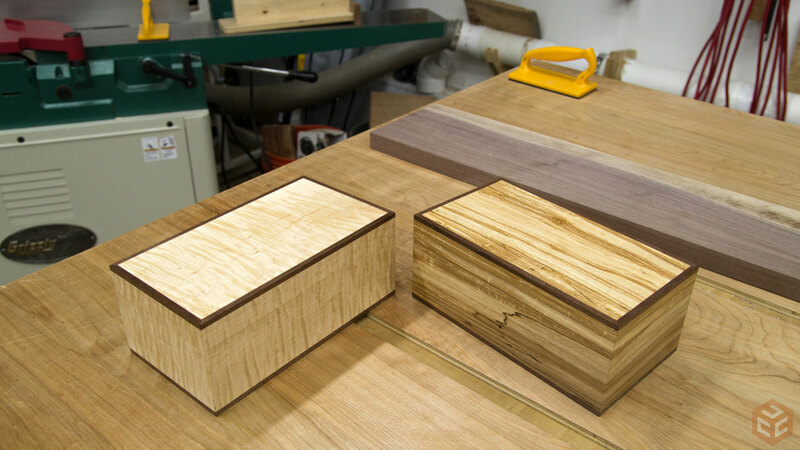 I’m making some walnut boxes and was planning to use ambrosia maple for the tops. 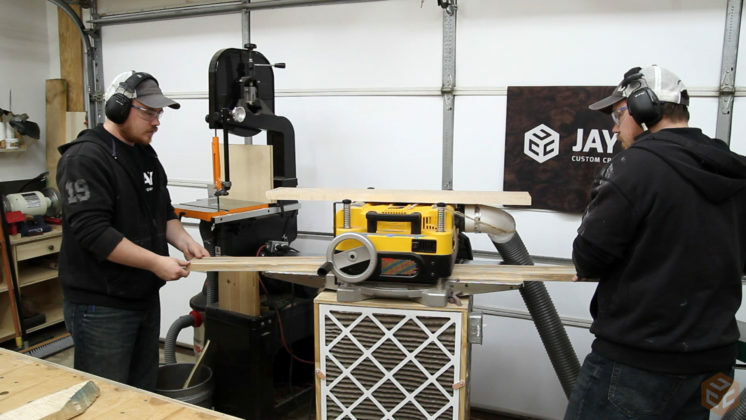 I like the idea of using homemade plywood for the stability vs. solid wood. 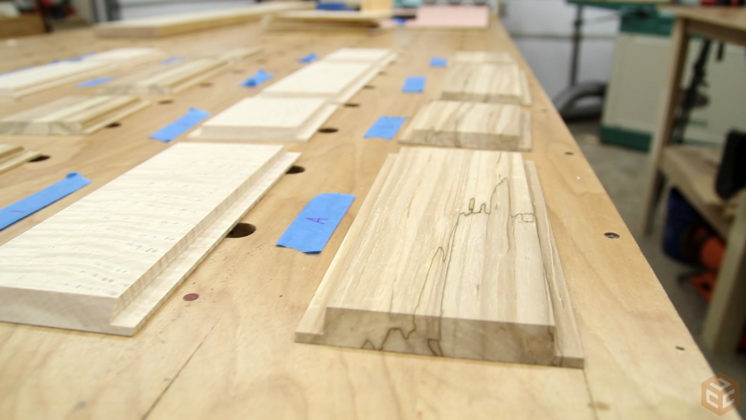 One question on the plywood – did you glue the figured veneer on both sides of the 5mm hardwood plywood or just one? How thick was your veneer? A gift worthy of a King… Nice job Jay…. 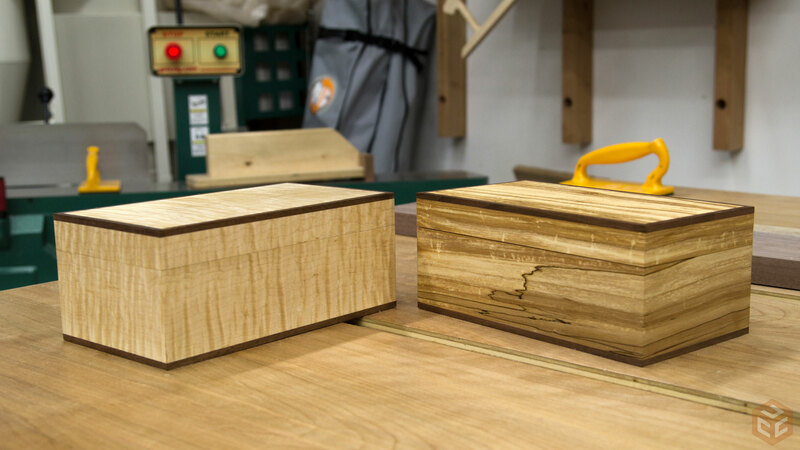 Might be worth trying to cut the top off the box at your bandsaw instead of the table saw, as the thinner kerf will give less grain interuption. Harder to get a perfectly straight cut I know, but you seem to have good results with resawing so I’m sure you could handle it. The resulting surface requires too much sanding as the bandsaw cut isn’t that great cosmetically. What was the brand and source for the stay open hinges you used? Also, could a person add tape to the edges of the box wood before cutting the miters to avoid the time you took to tape them up for gluing? You could add tape before cutting but in my experience the tape tears slightly at the edges when cut so the precise edge of the tape that is needed just isn’t there. Thanks Jay. Those hinges are a bit pricy, but considering the time invested in a quality box and the fit and features of the hinge, not unreasonable. 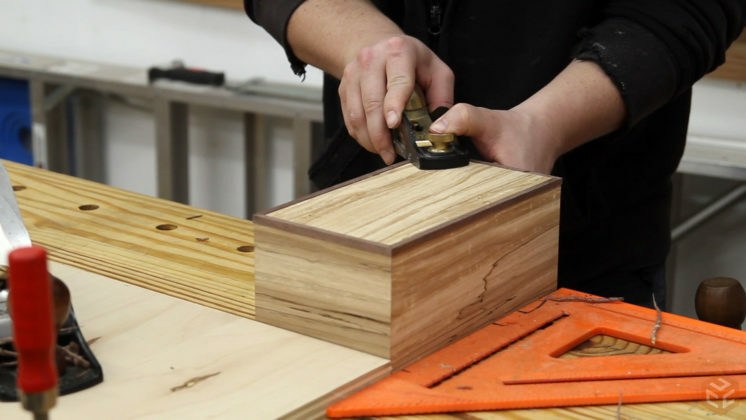 Your box making video was my first time watching your work and I was very impressed. Keep up the good work. Hi jay, always great work. I have a question and it’s just not for you per say. Why use your band saw to make that large cut and not your table saw? I see this done a lot? 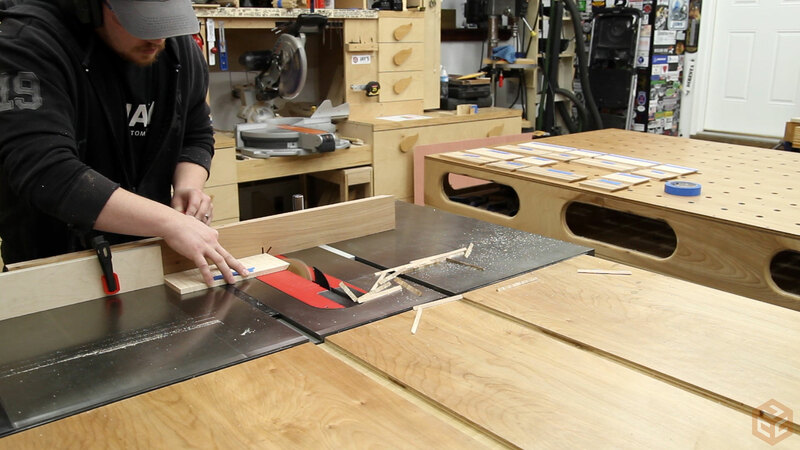 if the wood does not have a flat bottom face there is the potential to rock back and forth on the table saw surface. 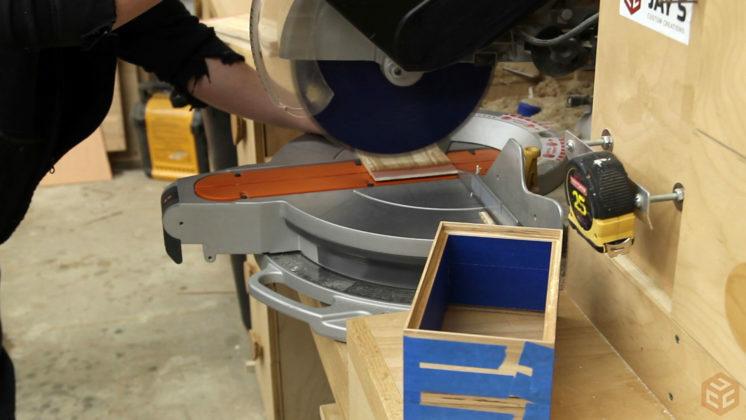 That type of movement on the table saw increases the potential for kickback to occur. So in that regard, pushing it forward through the bandsaw is a lot safer.